As it was written by the same author as Swan Song, Setoguchi Renya (瀬戸口廉也), from Kira Kira I was expecting another psychological study on darker parts of human behavior. 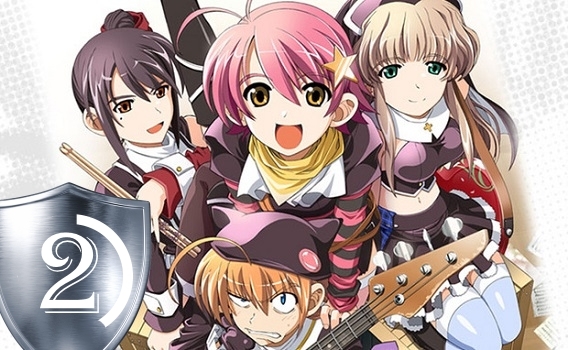 What I got instead, however, was a relatively run-of-the mill slice of life vn with a group of, otherwise honor students, deciding to form an anti-conformist punk band for a school event. While darker themes do indeed appear in the last tenth or so of the novel, the majority of time is spent on adolescent slice of life tropes and the somewhat underwhelming rebellion against social norms, more in the form of comedy than serious drama. I found myself getting tired of the premise and characters by the time I came near the end of the extremely long, bloated common route, the exhaustion from which seriously impaired my experience with individual stories later; especially after I realized that the bigger half of the common route is hardly even relevant to anything in the end. Then again, individual routes, while not the pinnacle of drama, are fairly interesting and dramatic at times, with Kirari’s even having some darker themes present. Though unlike usual Renya, those themes felt almost out of place compared to the laid-back start and the middle portions of the work. It was also a bit disappointing that the band didn’t factor much into them; I was hoping to see some music-industry related struggles, but in the end, the whole band thing was more about forming bonds between characters than actual music. Personally, I would have liked Kira Kira a lot more if it had a shorter common route, as, while bloated it still is a relatively well written piece of character drama, tackling issues such as adolescent rebellion, subtle difference between friendship and love, and poverty. Oh come on. It just seems you were expecting something different. I have come to like Overdrive’s works, I played Deardrops before Kira * Kira but of course they are different. Yes, probably the common route is too long but as you say it’s well written. Now with the routes we encounter a common problem and it’s they vary greatly on impact. Serina and Kirari were good and the loose one is Chie. I myself am kinda interested in punk, so it was a plus but it will probably be lost on most readers. The decision to put some heavy drama in Kirari’s route was bold. I am bashing Chie’s route but it gives a good insight on her persona and the difficulties she has growing up. Even though I consider Shikanosuke kind of a weasel and definitely not a good person, he has things going on for him. Overall a solid story with great themes, above the majority of eroges you can come across (in English, of course). I was expecting something different because it was written by the same guy who did Swan Song. It did have its moments for me, mainly at the start of the trip, and the darker parts of Kirari’s route, but what it turned out to be in the end wasn’t exactly the type of story I normally enjoy, I guess.